Trip featured recognition of breakaway states, description of Israel as "genocidal"
(CNN) -- Venezuelan President Hugo Chavez returned home Friday after a sometimes controversial nine-country tour and said he had purchased weapons from Russia. 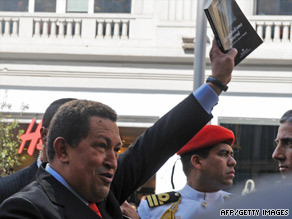 Venezuelan President Hugo Chavez waves a book Friday during a visit to Madrid, Spain. Chavez appeared on Venezuelan news channel Globovision in Caracas, and he had a message about a purchase he made in Russia. "By the way, we signed some military agreements with Russia. Well ... soon will arrive some little rockets," Chavez said. "We are not going to attack anyone. ... Those are only defense instruments because we are going to defend the nation, from any threat, from wherever it comes." Chavez said the rockets could fly as far as missiles with a range of 185 miles. Chavez made news on many parts of his recent tour. In Moscow, Russia, on Thursday, he announced that Venezuela has decided to recognize the independent republics of Abkhazia and South Ossetia, becoming just the third country, after Russia and Nicaragua, to do so. Chavez earlier had visited Iran, where he pledged to export 20,000 barrels per day of gasoline to strengthen bilateral ties. He also visited Syria, where news reports said he told thousands at a soccer stadium that Israel's government was "genocidal." Chavez's tour also included stops in Libya, Algeria, Spain, Turkmenistan, Belarus and Italy.